JSP is delighted to donate £13,461.00 to the Lighthouse Club raised from sales of their Lighthouse range of Safety Products. JSP are passionate supporters of the Lighthouse Club and for every product sold in the UK from this selected range of Personal Protective Equipment, JSP make a contribution to this valuable charity to support the Construction Industry Helpline. The money raised will help towards promoting and supporting this Helpline which provides confidential, 24 hour support and advice for the Construction industry’s workforce and their families on any problems they are facing, including occupational health and wellbeing, mental health, or financial difficulties caused by accident, illness or bereavement. 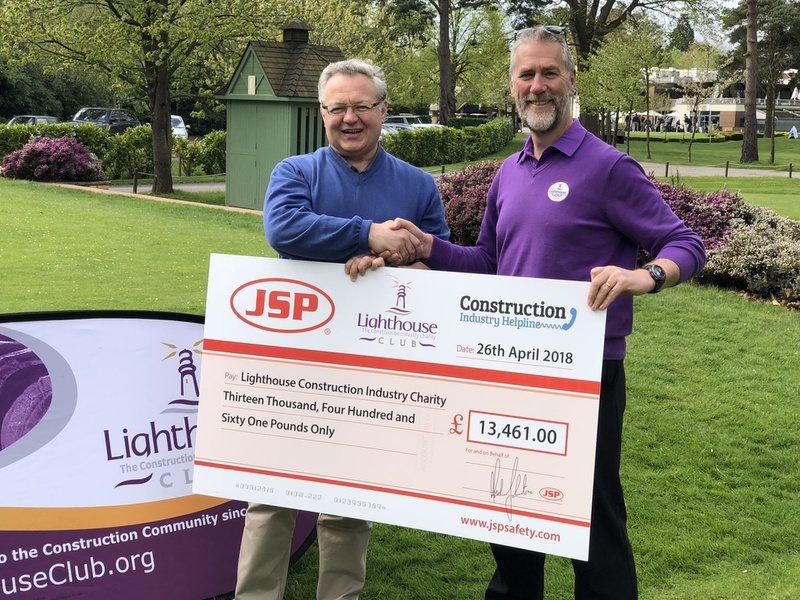 Mark Johnstone, CEO of JSP Ltd, handed this large donation to Bill Hill, CEO of the Lighthouse Club, at the annual JSP & Team at Heathrow Construction Industry Charity Pro-Am Golf Tournament at Foxhills Golf Club, Surrey. Last year, the Construction Industry Helpline supported over 1500 construction families in crisis and over 400 families were granted £705,000 of emergency financial help. Of the 1500 callers, 1100 of these were given advice and support on issues ranging from stress and depression to legal, debt management and taxation advice. You can support JSP and help raise money for the funding of the Construction Industry Helpline by specifying the JSP Lighthouse Safety Range of PPE.